Cross Canada Hop: Cards, Cards, and More Cards! Welcome to another Cross Canada Hop! 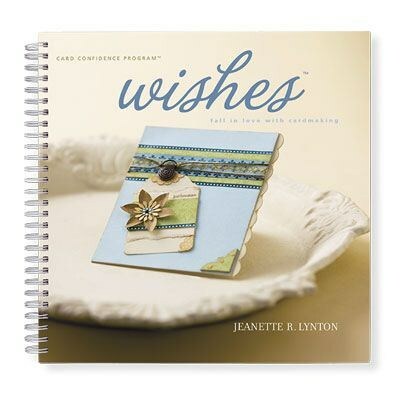 Join us as we focus on Close To My Heart’s How-To Program card books. If you arrived here from Arlene’s Creative Space, you’re on the right track. If you’d like literally hop across Canada, pop on over to Michelle’s blog to start there. Just keep hopping until you get back to where you started. These are the two books I used. Every month I design 5 cards for my Creative Card Club. 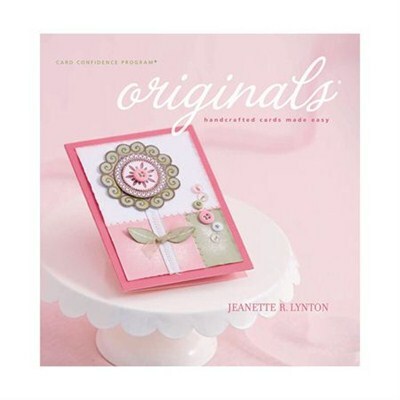 I choose a collection of products, paper, stamp and embellishments, to create with and I have to stick to those items. Sometimes it’s more challenging than others. This month my group will be creating with my current favourite, Hopscotch. I’m sharing 3 of the cards they’ll make on Tuesday. This first one is from Originals, pg. 59. The pattern is called Lucky 3. The second one is from Wishes, pg. 55, called Stay Left. And this last one is also from Originals, pg. 71. The pattern is called A Heartfelt Classic. I had some fun random stamping on this one. Which one is your favourite? I’d love to hear what you think. 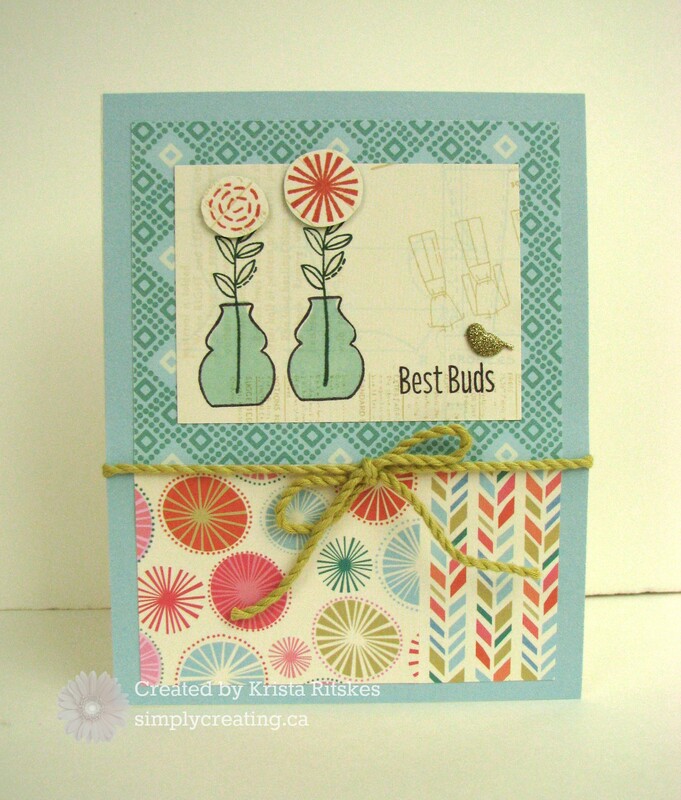 Now, it’s time to hop over to Lucy’s Creative Expressions to check out her lovely cards. If you get lost along the way, just click here to go to Michelle’s post where she has a full line up. After the club ladies receive their instructions, I also post them here on my website, so you can make them, too.They’re available for immediate download for just $5. Check out what I’ve got available right now by clicking here, and if you’d like to create these ones, stay tuned. They’ll be up soon. Great cards, love what you created using Hospscotch. Your class will love these. Love your cards Krista! We chose the same paper and pattern for one of our cards, but they are completely different!!! I love the last card best! great job love the little puffies. Love the use of puffies on these cards, they really make them special! 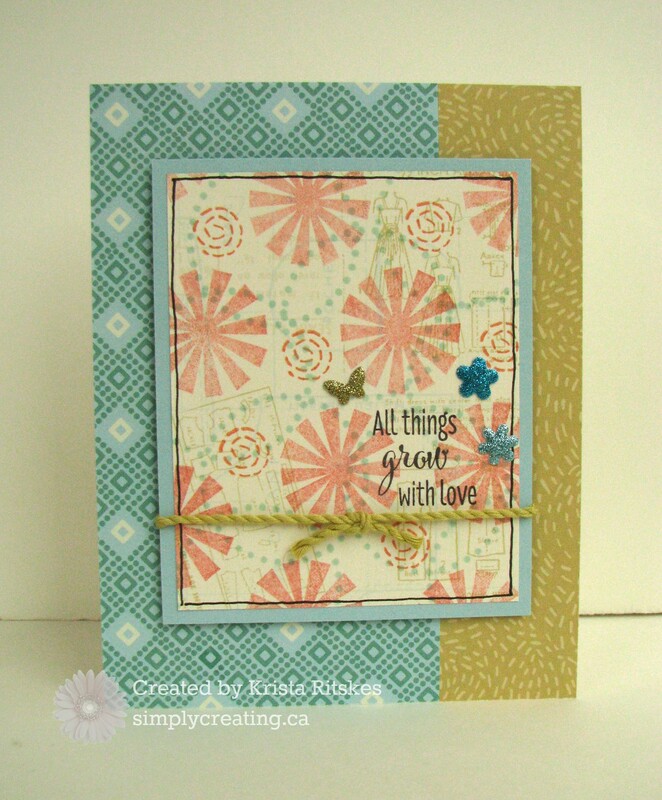 Love your cards, Krista! I especially love the last card with the random stamping. That is such a fun technique and you have really done a beautiful job with it.